How Much Money is Actually in the Brink’s Truck When It Backs Up? I wanted to answer a simple question: How much money is actually in a Brink’s truck? But no one wanted to give me a straight answer. My interest in the subject piqued after noticing that lately people like to say “back up the Brink’s trunk” every time a professional athlete signs a large contract. The most recent example is Green Bay Packers quarterback Aaron Rodgers, who’s certain to get “Brink’s truck money” if, and when, he agrees to a contract negotiation with the Packers. 2 Chainz raps about driving his own personal Brink’s truck and dropping it off at the valet. And Gucci Mane has an entire song dedicated to Brink’s trucks. 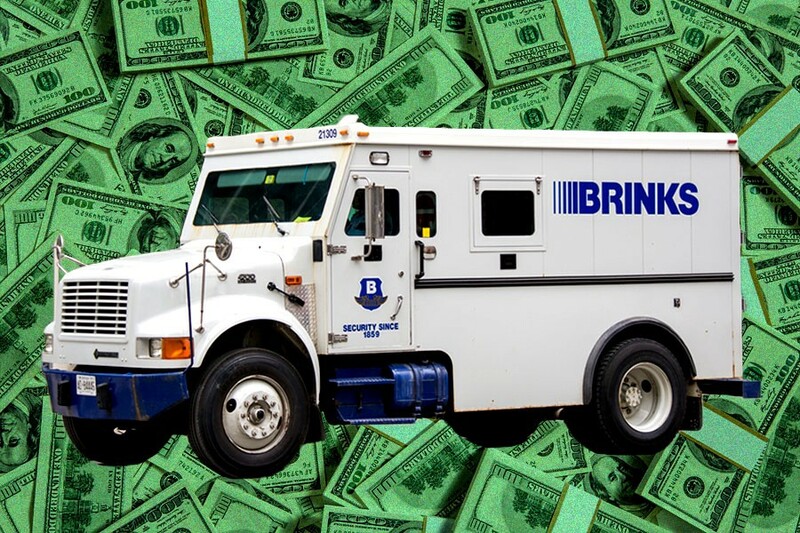 All this talk about Brink’s trucks got me wondering about the precise amount of money a Brink’s truck can carry. Or better put: When we talk about someone getting a Brink’s truck worth of cash, just how much money are we talking about (more or less)? Armored truck operators were reluctant to answer this question, seemingly because they thought it might compromise their security. Brink’s’ PR department straight up ignored my two emails. (And I know they read them; I have an email tracker.) Dunbar and Loomis, two other large armored truck service providers, were similarly unresponsive. Dismayed but undeterred, I thought I’d call small, local firms, as small businesses tend to be more receptive to such requests. But I experienced the same resistance. “That isn’t information I want to release,” Scott Gaglio of Fortress Armored Services Company in L.A. told me. That’s pretty rich coming from a guy who brags on his website about his armored trucks being used in the 2003 remake of The Italian Job, a movie that’s literally about robbing armored vehicles. Tom did provide one useful tip, though: He suggested I speak with someone at the Department of the Treasury. I called and emailed the press contacts at the Bureau of Engraving and Printing, the Treasury division that manages print currency, but they ignored my requests for information. However, their counterpart at the U.S. Mint, the Treasury division responsible for coinage, was slightly more helpful. Thanks to a Mint spokesman, I learned the U.S. government regularly contracts Brink’s, Dunbar and other armored transportation companies to schlep large amounts of money to and from Federal Reserve banks. But he’s less forthcoming when I asked him how much money is in one of those trucks. “I don’t know, and I wouldn’t tell you anyway,” he offers. I did find a few private security providers who were able to shed some light on the subject, though. Kris Herzog, the 51-year-old owner-operator of the Bodyguard Group of Beverly Hills, a personal security firm that caters to the uber-rich and famous. His past clients include former presidential candidates and celebrities such as Jon Voight, Paris Hilton and Kim Kardashian (though not when she got robbed in Paris). Herzog is also an intensely serious man — he genuinely believes that the next major terrorist attack on U.S. soil will involve a lone wolf-style operative killing a high-profile starlet in public. Herzog says he’s transported as much as $2 million in 100-dollar bills to a client. And that much money fills up half the trunk space in one of his vehicles. So it stands to reason that you can fit about $4 million in there if the trunk was packed to the brim. That said, the Bodyguard Group usually only deals in armored Cadillac Escalades, not Brink’s-type armored vehicles. To better understand the latter, I turn to Anthony Ash, the 50-year-old proprietor of LA Federal Armored Services. Ash alleges that a classic armored truck can hold hundreds of millions of dollars. Banks rarely work in denominations higher than $100 bills, Ash says. And a “strap” of 100s — one of the banded stacks of $100 bills you see in films — is worth $10,000 (or a hundred $100 bills). A “bundle” is 10 straps, worth $100,000. A “rack” is 10 bundles, or $1 million. A pallet can hold 100 racks, or $100 million. And your standard-issue armored truck can transport between four and six pallets, or up to $600 million. There we have it: A Brink’s truck, when filled to maximum capacity, is carrying roughly half a billion USD. Not to mention, most armored trucks aren’t allowed to carry nearly that much money because of the liability. “The most we can carry on one of our trucks is $2 million, based on insurance,” Ash says. So the $2 million to $4 million range seems to be the amount we’re talking about when we talk about Brink’s truck money. Or in NFL terms: Blake Bortles just signed a three-year deal with the Jacksonville Jaguars worth more than 13 fully-loaded Brink’s trucks.